Get Ready to Meet Jackie and Bobby on Bigg Boss 11. This season of Bigg Boss is all spiced up with hot news every day. Salman Khan who is hosting the most controversial show every weekend is also promoting his upcoming movie Race 3. Race 3 has only recently gone on floors and has already boosted its promotions. The film has been one of the most exciting projects, given Salman is filling in the shoes of Saif Ali Khan who previously pulled on the male lead in the film. Looks like Salman is promoting the movie by bringing the whole cast of Race 3 to the sets of Bigg Boss 11. 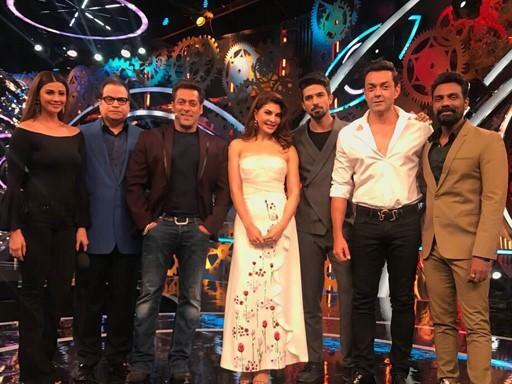 Looks like Race 3 is happening sooner than we thought because Salman Khan has shared a picture of the Race 3 team on the sets of Bigg Boss with Jacqueline Fernandez, Daisy Shah, Saquib Saleem, Bobby Deol, Remo D’souza and Ramesh Taurani in one frame. While the airing date hasn’t been publicized, we have every reason to be excited now. While the movie has a long way to go – Eid 2018 release, the team is nose-diving into promotions already. “In the upcoming episode of Bigg Boss, Remo and Jacqueline will be going inside the house and challenging the contestants to a dance-based task. They will be shooting for the show today. A source told another media house that, “Salman has already started shooting for his film and he decided to kick start the promotions already by getting in Jacqueline and Bobby on the show. Both the actors will shoot for the episode and it will air on Sunday. We are excited about the new episode of the Bigg Boss to see Jackie and Bobby inside the house for a while. Aren’t you excited? Why is Bigg Boss 12 Losing the TRP Game? Will Race 3 Break Salman's Previous Eid Records? Finally SRK Will Be Seen On Bigg Boss!!! Salman to Exit Bigg Boss? SRK Will Be On Bigg Boss This Year! Who Wants To Be A Bigg Boss Contestant This Year?